Today I give the floor to Steve Wake, the man behind #EVA21, the conference so cool it is known only by its hashtag*. In his own unique style he explains what makes this magical conference work every year, why you should deAgile yourself and how to tame the overwhelm with a single piece of paper. 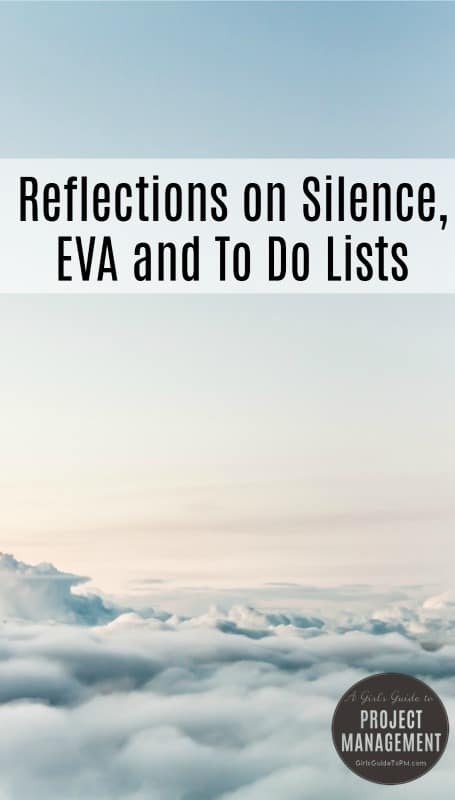 EVA was first started as an event to raise awareness and profile for what we now know as Earned Value Management. Nobody was going to market it for me so I had to learn by doing. One day, 10 presentations. All about Earned Value. Now we have two days and over 20 presentations, of which one might be about Earned Value. It is all about Building a Better Project Manager. The Thinking Person’s PM. Total PM. A way of life. Not a job. It was always a little different. It was the event I wanted to attend. Few come close. Even now. It has always remained ahead of the curve. I like new ideas. I like new presenters. I like practitioners. We never repeat presentations. Return presenters talk about something else. I like ideas from elsewhere. I like metaphor. I like stories. I am the only curator I know who does this. I am not just a plain event organiser or marketing executive. I know or get to know the speakers. I work with them on presentations. I do not buy them from the catalogue. And I don’t take kindly to corporate ‘control-freakery’. I am a producer, a curator. EVA is my diary, my State of the Nation. Who I have met and seen or stalked or pitched at with a view to presenting. I now get few refusals. People want to come listen, talk and speak. The conferences are small, up to 100 attendees. If you stick around for 2 days you get to know everybody and the speakers stick around too. It feels like Glyndebourne and Davos. You go away with new ideas rather than a reconfirmation of what you already knew. The amount of time and money wasted on pointless tub-thumping makes me cringe. I’ve just come back from a lovely 10 day ‘break’ in sunny Seville. If you haven’t been, you must. I came back unrested. I had been checking my smartphone every 15 minutes or so. Responding where I could. But not where I should. I should have ignored it. Turned it off. I still came back to 350 emails which I spent day 1 of my return responding to. Observation #1: The sky will not fall in when you go away. Rule 1: Do not check email when away. 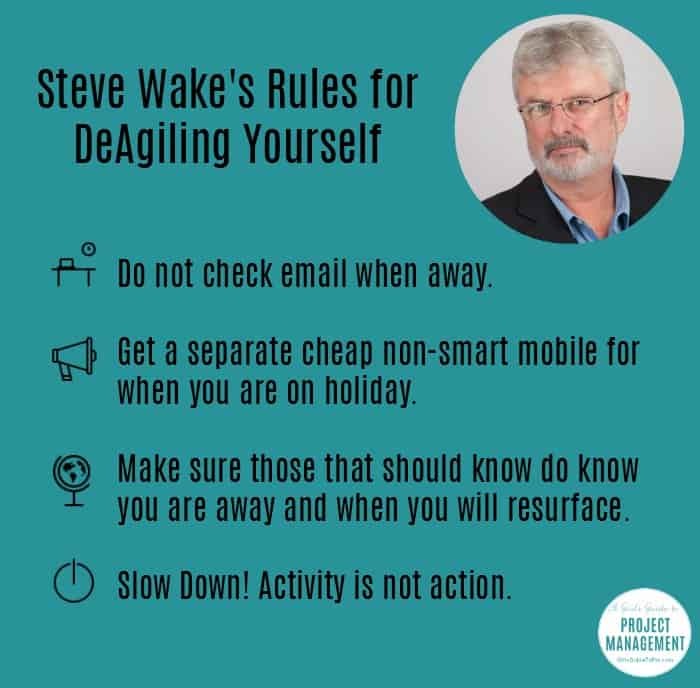 Rule 2: Get a separate cheap non-smart mobile for when you are on holiday. Rule 3: Make sure those that should know do know you are away and when you will resurface. Observation #2: People, myself included get sucked in to the responsive vortex. You send an email. You expect an answer by return. You get tetchy and self-righteous if this doesn’t happen. You pay no account whatsoever to what has happened at the other end. Observation #3: Fast (Agile) response to email is often poorly thought through, ill-advised and sometimes unnecessary. The speed rather than the quality has become paramount. Trouble is the consequent unsatisfactory action or meeting makes this glaringly apparent. Rule 4: Slow Down! DeAgile yourself. Activity is not Action. I took a Japanese Trade delegation round London and then to dinner. Simpsons. They loved it. And they were talking and drinking and talking and drinking. But as the dinner progressed the conversation died down until it ground to a halt. I thought they were jet-lagged or cross about something. It was explained to me that there is nothing better than for a companionable silence to prevail. It signalled consensus, trust, contentment. Happiness even. I thought that was brilliant and beat, “Ooh isn’t it quiet? Somebody say something,” out of sight. I am addicted to music. I hear it in glorious 3D in my head. A photographic memory. I have the world’s largest CD collection. When I go out it’s generally to something with music. I do not like background music. I do not have it on in the car. It is too distracting. What I like is silence. Silence to reflect, to converse with myself, to plan things out, to ruminate. I find and need the time and space. It makes my decisions better and myself happier. I don’t feel irritable or hassled or put upon. It’s my own tempo, my own control. I wake up sometimes and think OMG I have so much to do. It can be daunting. So I compartmentalise like this. Jot down all the topics of things I have to do. Join them with lines and boxes and arrows. Lots of them link together. The paper becomes a scope, a target. Once it’s in boxes and links and lines it become manageable and achievable. In my head. In me. I have visualised and externalised. You may have to fight to create that. But you can, and you can do this in silence. I also try to bookend this short meditation technique. I was taught this by a Vietnamese colleague 35 years ago in Paris. Think of a single thing. Picture an object, concept, phrase or piece of music. Exclude everything else for 5-10 minutes. It clears, focuses and steadies. Then do something. Like fill out a page of A4. Do this every now and again. Me? Every 2 or 3 weeks or just before I go away. So I know how all the plates were spinning. Then I review it when I come back. After thinking about these, I think I am a real mixed up extrovert introvert who has found that listening to people is far more enriching than blowing your own misguided trumpet. Particularly if you are a real leader and want to make change that sticks. Getting other people to really buy in to what you want them to do so it becomes theirs and makes it good for everybody is my aim in leading a good life. But that’s for another time. About Steve: Steve Wake has worked in the print, automotive, aerospace, defence, insurance and IT industries as a project manager and consultant. He is an internationally acknowledged expert on Earned Value Project Management and has written and presented many times. He is currently chairman of the Board of the Association for Project Management in the UK, pursuing a campaign of Listening, Learning and Leading as a way of being as well as doing Diversity properly. Steve has also had to become an accomplished event organiser and chair with his own EVA conference in its 21st year as well as continued close involvement in the high profile PMI UK Synergy events, both productions with a reputation for the unusual and innovative. His long passion for all kinds of music is almost matched by his continued appreciation of silence. * I’m kidding about the hashtag. The conference has been around longer than hashtags. Thank you for this article! Shutting off and truly relaxing on vacation is something I have a problem with. I always feel I need to be productive. I know the feeling well. I’m heading off on a short break soon and I’m going to try really hard only to work on the days that I am there to work. The rest of the time, it’s holiday!